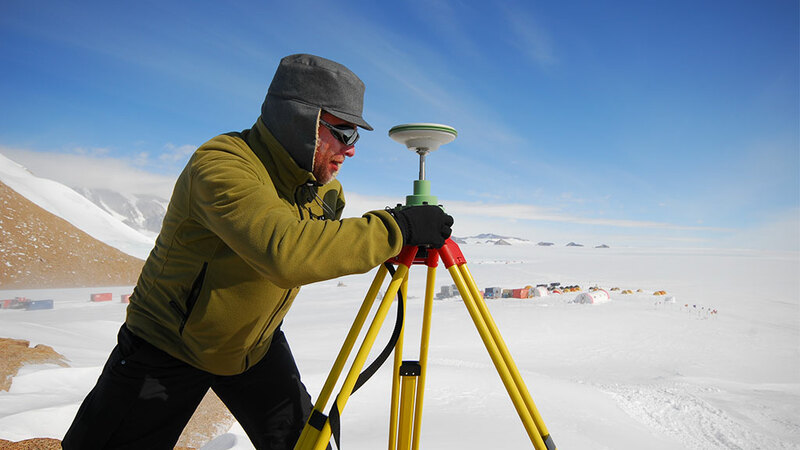 Dr. Frank Pattyn is a Belgian glaciologist and ice sheet modeller currently studying grounding lines - the last point of an ice sheet that rests on continental bedrock before the ice starts to flow over water to form an ice shelf - and their potential impact on future sea level rise. What is ice sheet modelling? The major purpose of ice sheet modelling is to make predictions of how an ice sheet will react and/or behave in the future. Computer models enable us to simulate or describe what is happening now in the system, and then impose perturbations to see how they might behave in the future. Yet in spite of this, models are still subject to a lot of uncertainties unfortunately. For example, some of the most reliable data is connected to climate and atmospheric conditions. This feeds directly into models through snow accumulation and melt, and also snow and ice temperature. But of course, ice also moves over bedrock, which in turn governs much of the internal dynamics of the ice sheet. And the problem there is that we cannot directly measure what is happening at the point of contact. That is why all sub-glacial processes are so important, and why they need to be better understood. If we look at the predictions that have been made by the IPCC's Fourth Assessment Report, they are based on models that take into account atmospheric components to predict the direct impact of surface melt and the quantities of melt water flowing into the ocean, but not other processes of transport such melt water that flows to the depths of the ice sheet, lubricates the bed, and dynamically accelerates glacial flow. Understanding these processes will be one of the major challenges to be addressed in the IPCC's Fifth Assessment Report. We observe that glaciers are accelerating everywhere around Greenland and West Antarctica, but we are still uncertain about the interactions going on at the sub-glacial level, or at the point of interaction between the glacial ice and the ocean. How reliable can models ever become? To be sure, today's models already provide us with conservative estimates. We see that glaciers are accelerating, but what we don't know for sure is whether this acceleration has something to do with natural variability or if it is really due to climate change. We can't say whether the ice sheet is going to continue to flow at its current rate, accelerate, or even stop. So we need to understand all the different processes first. Under the European umbrella, one of the initiatives trying to shed some light on this is ice2sea, lead by Dr. David Vaughan of the British Antarctic Survey (BAS). This initiative will contribute to the IPCC's Fifth Assessment Report and will be looking at key glacial processes and uncertainties. Indeed, one of the key things we will be studying is the role grounding lines play. This is important because when a grounding line retreats, it increases the mass transfer of ice to the ocean. But we will of course also be looking at things such as glacial lubrication due to surface melt and the flow of water from the surface to the base of the ice sheet, and also sub-glacial lakes and their effect on ice flow. The resulting modification will be implemented on large-scale ice sheet models and we hope to be able to extend predictions to 100 or even 200 years into the future. If you think in terms of policymaking, especially for places like the Lowlands in Europe, it is important that we go further than just 100 years. What exactly is a grounding line? A grounding line is the point where the ice sheet - which has been resting on bedrock, arrives at the ocean and starts to float. The part resting on bedrock is the ice sheet and the floating part is an ice shelf. The limit between the two of them is the grounding line. So basically whenever ice passes the grounding line, it becomes part of the ocean and has the potential to raise sea level. But of course this grounding line is not static. It can move. If an ice sheet becomes bigger it expands horizontally and the grounding line moves forward, the result is that there will be more ice stored on the bedrock and less ice in the ocean, so you get a lowering of sea level. But if a grounding line retreats, it means more ice becomes part of the ocean, and sea level rises. You are one of the first scientists to have worked in and around the new Belgian Princess Elisabeth Station as part of the Belgian Antarctic Research Expeditions (BELARE). What was this work about, and what have you learned from it? It is too early to say what we have learned from it, as we are still in the process of analyzing all the data. However, over the last few expeditions, we have worked in an area where we have been able to measure the interaction between the ice sheet, the ice shelf, and the ocean at the grounding line. For this, we took a highly multi-disciplinary approach with the goal of using all the information we could obtain. Radar specialists measured the ice thickness and analyzed the magnitude of reflection to see what kind of substrate lie underneath the ice sheet - whether it is frozen to the bed, or whether it is resting on wet sediment and thus in contact with the ocean. With radar, we were also able to visualize internal layering of the ice sheet, which is fantastic for modelling because that's really a way of better constraining the ice sheet models. These internal layers, more or less parallel to the surface of the ice sheet, are seen as isochrones (layers of ice from the same time period), which enables us to examine whether any rapid changes have occurred in the past, or whether there are any changes in the accumulation pattern. But we also drilled through the ice shelf into what is called marine ice. In the ocean near the grounding line, you have cases of ocean currents driven by thermohaline circulation coming from deep in the ocean, which has the possible effect of melting the base of the ice shelf and making the grounding line retreat. But this oceanic water also refreezes underneath the ice shelf further away from the grounding line. As far as we know today, this marine based ice might either stabilize, destabilize, enhance, or just retain the flow of ice shelves at their current rate. Anything is possible, which is why drilling into them and retrieving samples is very important. Aside from BELARE, what other field projects are you involved in? Aside from Antarctic ice sheets, I am also interested in glaciers. For this, I have been working in Alaska, mostly with radar, studying a glacier that has been well documented since the International Geophysical Year (IGY) of 1957-58 and has a lot of data linked to it. Through this work, we are trying to understand the reasons for the sharp acceleration in High Arctic glacier retreat. In the Southern Hemisphere I am working in Bolivia on a combined glaciology/hydrology project looking at the mountains and glaciers that provide the city of La Paz with its water. We know that there is an increase in melting, and we are trying to estimate the remaining volume of ice in order to evaluate the state of the whole hydrological system on which La Paz depends. For the rest, I'm also involved with sub-glacial lakes. For me, these go hand in hand with grounding lines. Sub-glacial lakes are less complicated to study than grounding lines, but still have quite a lot of interesting dynamic features like drainage and rapid drainage that I am trying to understand. And this is also a way of doing modelling, not only prediction, but trying to understand the entire system. We know how an ice sheet flows, we know how circulation in the lakes works, but we have no clue what the combined effect is, because it is something you cannot measure 3,000 metres beneath the ice. So far, we can only guess. But if we just use our knowledge of physics and study a couple of these lakes, we might be able to better understand the master model and apply it to ice sheets. A glaciologist and ice sheet modeller at the Glaciological Laboratory, Department of Earth and Environmental Sciences at the Université Libre de Bruxelles (ULB) , Frank Pattyn is a key member of the international ice sheet modelling community and a leading expert on ice sheet dynamics.